Find My Workspace lists over 95% of the serviced offices market in Outram. Simply click Request Quote to check pricing for one office, or Add to Basket for multiple offices. Located in the captivating heart of Duxton Road, this location is a vibrant destination designed for lifestyle, productivity and engagement. Be inspired by verdant greens and an abundance of natural light as you overlook the charming neighbourhood. Enjoy a variety of lifestyle, entertainment and shopping options within a thriving community that is home to Singapore’s coolest bars and restaurants. Spacious desks are accompanied by comfortable chairs. Meeting rooms are kitted out with whiteboards and conference facilities. Regular networking events enable you to mingle with your co-workers, share knowledge and build lasting relationships. The onsite management team are able to assist with any business requirements. 24/7 building access enables you to work at times which suit best. High speed Internet keeps your operations running quickly. Flexible terms are available. Breakout areas feature ergonomic furniture. Large windows offer excellent views. Join this co-working community and be surrounded by like-minded individuals. Nestled within a unique conservation building, this business centre offers amazing, large, light-filled floor-plates that can accommodate growing teams of more than 100 people. 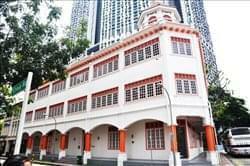 Once home to the famous Tiger Balm factory, this building’s rich sense of history will appeal to everyone looking to experience a different way of working. With two levels of office space on offer, plus an open rooftop area, and a selection of food and beverage establishments on the ground floor, this exciting addition to the Keong Saik neighbourhood is more of a work and lifestyle destination than it is purely office space. This brand new centre, located in Raffles Place, comes as a fully managed and furnished work space. Tenants will be able to take advantage of private space as well as having the flexibility to participate with community. There is full access to common areas and breakout areas where phone booths are located for private business calls. This intelligent work space also comes with highly customisable, full video conferencing capabilities, open plan en suite manager rooms as well as access to event space for up to 100 people. 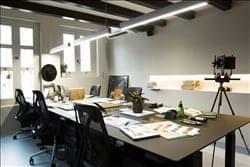 This warm and welcoming, designer space offers a wide selection of comfortable private offices, designer meeting rooms and functional business club perfect for networking. The spacious design with casual seating offers creatives the environment they need to collaborate with like-minded professionals to cultivate exciting opportunities. Fitted with a stunning glass façade and filled with long, bar-like tables and desks, this space is sure to make you feel right at home. Perfect for the creative professionals who need that place that’s genuinely inspiring. This space is a collection of private offices for those who want to focus on getting work done. The centre offers offices which accommodate teams of between 2 to 9 people—perfect for startups, or MNCs seeking to venture into a new market. All offices are fully furnished and come well-equipped with electronic adjustable height desks and ergonomic chairs. There are Bluetooth speakers and ample storage. There is 24/7 access and a concierge. To obtain information for your selected Outram Serviced Offices, please tick the "Add to basket" box for each office you prefer and complete the form below. We will then send a detailed report via email.